With the integration of mobility and manipulation, mobile manipulator constructed by mobile platform and manipulator has become a potential solution for the fields of industrial manufacturing and services. One of the key issues in utilizing the mobile manipulator is the motion planning, i.e., finding a feasible and efficient trajectory for operation. Compared with the traditional motion planning methods on mobile robot and fixed manipulator, the motion planning of mobile manipulator is more challenging due to the high degree of kinematic redundancy from the coupling of mobile platform and manipulator. And the optimization problem becomes more complicated by the integration of the high degree of kinematic redundancy, obstacle avoidance, constraints and task requirements. To address the issue, the integrated kinematic model is proposed, including mobile platform, manipulator and their coupling property. 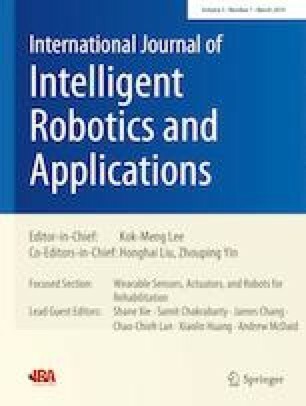 Subsequently, the coordinated motion planning for mobile manipulator to generate a collision free trajectories from the initial state to target state is developed, where the trajectories of mobile platform and manipulator are planned simultaneously by optimization-based method. The proposed motion planning algorithm is implemented and tested in various environments. Simulation and experiment results demonstrate the good effectiveness of the proposed motion planning algorithm. The online version of this article ( https://doi.org/10.1007/s41315-019-00090-7) contains supplementary material, which is available to authorized users. This work is supported by Natural Science Foundation of Zhejiang Province, China (No. LY19E050016), National Natural Science Foundation of China (No.51875508), Youth Funds of the State Key Laboratory of Fluid Power and Mechatronic Systems (Zhejiang University), and Science Fund for Creative Research Groups of National Natural Science Foundation of China (No.51821093).